It was really more of a training session [Canine Good Citizen (CGC) Test] with Troy Smith of LARPBO, but with the dogs walking backwards and forward and jumping on boxes it was quite entertaining. More interesting than that the dogs were all pit bulls. There were about 20-25 pit bulls training together within a few feet proximity of each other. They were all responsible pit bull owners and had their dogs leashed. Some even took further precaution and had their dog wear a muzzle or electric dog collar. All shapes, sizes and ages of pit bulls were interacting with each other as trainer Troy Smith of LARPBO stood on a box and called out commands to the dogs and their owners. It is most commonly thought by people that pit bulls are very aggressive and not friendly to strangers, but I must say what I saw was the complete opposite. They were even doing drills where one of the LARPBO staff would walk up and shake the owners hand to see if the dog would react aggressively. I don’t think any of these dogs or owners even knew each other though they were all working together with their dogs on the lawn and from what I could see there was no hostility. I think raising a dog is somewhat like raising a child. There is a formula to getting the best results. With the proper discipline and respect and love and direction I think the outcome proves positive. There are often cases where a child grows up troubled and violent due to the lack of these elements. Same as a dog does. On a latter note there are some rare cases where no matter what is done positive the outcome isn’t what one would expect. I believe with the help of the media the public has pegged the pit bull breed as killer dogs. We always hear about pit bulls attacking people and are often used in dog fights. What they fail to mention is that many breeds of dogs attack people and are used in dog fights. I believe that with a responsible pit bull owner you can have an obedient pit bull. If the pit bull is mistreated and not trained properly you should expect negative results as you would with any dog brought up in this type of environment. We are committed to educating the public about responsible pit bull and dog ownership, banishing the myths that the media feeds the public. We actively work together to share the truth about bully breeds: they are very loyal, loving, intelligent dogs who are amazing and wonderful family pets. Just like any dog, given proper obedience training, socialization with humans, and appropriate interaction with other dogs, this breed defies media misconceptions. By promoting attention and communication between dogs and owners we can show the general public what we already know: these are amazing creatures deserving of full and happy lives. 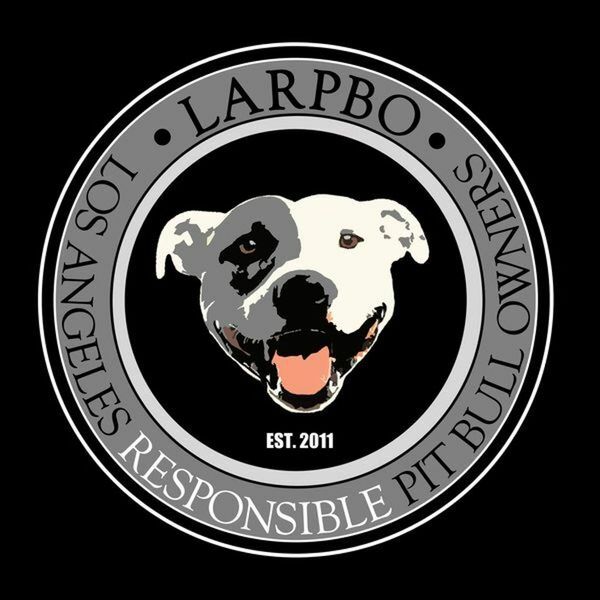 LARPBO promotes the importance of spaying and neutering all bully breeds, as well as rescuing and re-homing. The overpopulation of these dogs currently creates the assumption that these dogs don’t deserve a chance. With so much controversy surrounding the bully breeds today, our focus is not only to increase awareness of the issues that affect pit bulls and their ownership, but to work together to be a part of the solution. Our goal with Los Angeles Responsible Pit Bull Owners is to gather pit bull loving friends and owners as a community – a community dedicated to making a stand for our best friends and strive to do so with the same fun-loving outlook that our dogs have in life.